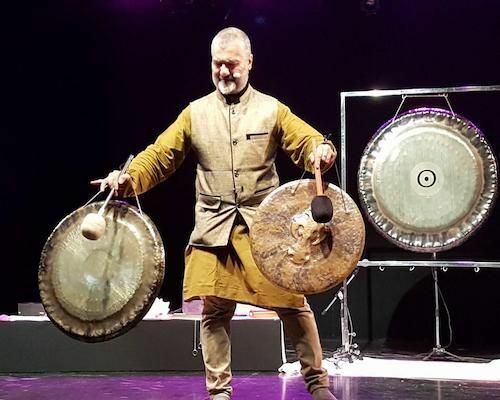 Sanj Hall is a traveling gong yogi, sound artist and a gong teacher, who has taken the divine order to spread the positive vibrations of gongs and holistic resonance to the world. He has been conducting gong baths, meditative concerts, therapy sessions, gong and sound healing workshops in over 80 countries across Europe, Middle East, Asia and North America. He also performs meditative “free spiritual jazz” concerts worldwide both as a solo artist as well as in collaboration with other sound artists, whether its an ancient instrument or modern electronic music, fusing healing sounds of nature and man-made, inspiring the inner Nada. His formal journey began about 28 years ago. Sanj started studying cognitive theories and techniques, which further evolved to “feeling” and “intuitive” schools and then delving into realms of spiritual practices. He has learned and worked with many spiritual masters and teachers and continues to add sound healing practices from different cultures, religions, and regions . He also spends a considerable time in ashrams and monasteries in India with yogis, deepening and widening his own practice in Sound Healing and Nada Yoga - the union of the individual mind with cosmic consciousness through the flow of sounds. He loves to collaborate, both with ancient wisdom elders, as well as the scientific community, bringing the best of East and West, as well as, bridging ancient, contemporary and futuristic sound visions. Research, travel, learning and teaching are four key parts of his sound healing life, with current projects on lithophone and gong rocks. He has founded an international sound healing academy, inviting other key teachers, as well, helping create more sound healers and teachers.